The race to the playoffs has reached a fever pitch in the NBA, and with several teams still fighting for positioning, there will be a slew of marquee games around the league this week. None will be more expensive than a Wednesday matchup between the Warriors and Suns, with Steph Curry and Co. invading Talking Stick Resort Arena in the priciest NBA game this week. The Warriors, Knicks and Nets also host top games through the weekend. The postseason may be out of reach for the Suns, but that won't stop fans from coming out to see the best team in the West compete in Phoenix Wednesday night. 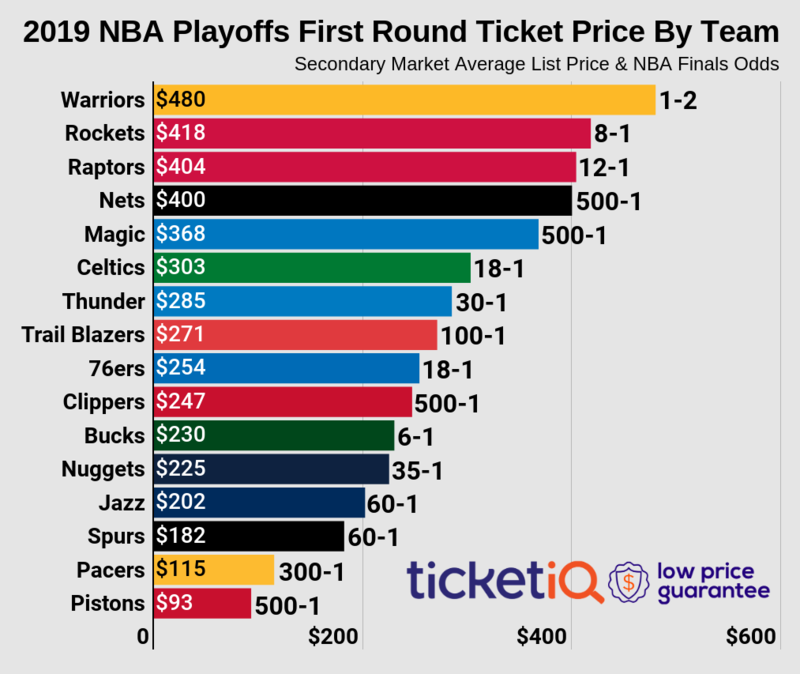 With the Warriors making their final trip to Talking Stick Resort Arena the average resale price for Suns vs. Warriors tickets is now $393. It won't be too costly just to get past the gates, though, as the cheapest available tickets are priced from $32 each. It's been a down year for the Pelicans, who have fallen to 11 games under .500 and will miss the playoffs for a second straight season. Still, the star power of Anthony Davis and DeMarcus Cousins is driving big ticket demand when they take on the Warriors at Oracle Arena on Saturday. Warriors tickets against the Pelicans average $341 and the get-in price is $83. It won't hurt that the Warriors are also expecting Kevin Durant to return from the knee injury he suffered early last month. The Raptors are looking forward to a fourth straight playoff appearance, and they'll hope to thin the Cavaliers and Celtics' lead in the East when they take on the Knicks at Madison Square Garden on Sunday. As it stands now Knicks tickets at MSG currently average $283 against the Raptors. Don't expect to get in for much cheaper as tickets start from $82 each. The standings are tight in the 5-11 seeds in the Eastern Conference, and the Bulls will need to finish strong if they hope to lock down a playoff spot. They'll take on the struggling Nets in Brooklyn on Saturday, where tickets average $269 and the get-in price is $54. There isn't much room for error, however, as they sit just a game ahead of the Heat and Pacers as the seventh seed in the east. Rounding out this week's top games is a Thursday game between the Wizards and Knicks at Madison Square Garden. The Wizards find themselves well in the hunt for a top seed in the east, trailing the third-place Raptors by a game and the Cavaliers by 3.5 games entering Tuesday night. They'll look to thin that margin in Midtown Manhattan this week. Knicks vs. Wizards tickets average $238 and the get-in price is $59.